I have purchased a companion for the beautiful Queen of Hearts that was gifted to me by Alexander Daniloff: the Queen of Swords. Isn’t she pretty and sweet-natured? 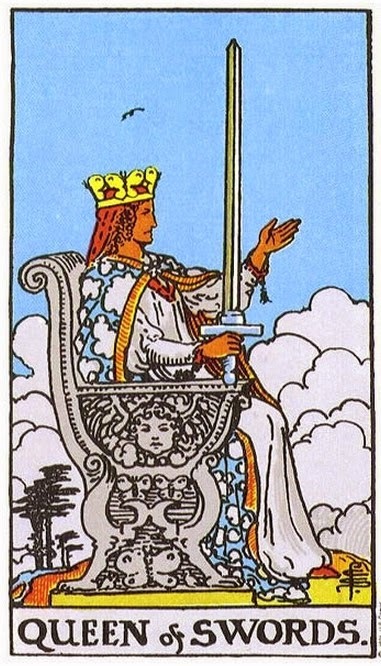 A far cry from the unhappy profile and bolt-upright sword that we associate with the Rider Waite Smith Queen of Swords, below. Often this lady is interpreted flatly as a woman alone/lonely with a harsh tongue as sharp as her sword: Brainy, but not very nice. This is certainly PART of the picture, but she is soooo much more than that! 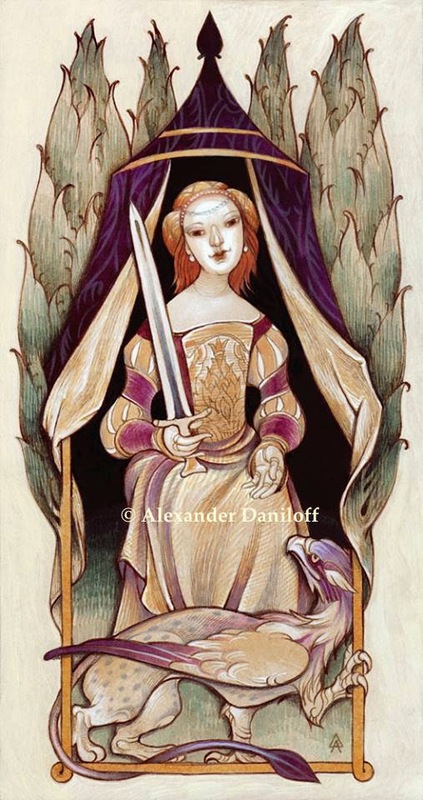 Add Alexander’s lovely Queen to your mental ‘Queen of Swords’ repertoire! Think of the word play of Dorothy Parker (‘if all the women in this room were laid end to end….I wouldn’t be at all surprised’). Alexander’s Queen is the woman at the party who can engage everyone in delightful conversation – chatting as easily with the children as she does with the Lords and Ladies of the land. She is a social butterfly – popular and witty. Her conversation can be as light as the clouds and as sweet as angels. Irritate her with your clumsy bumbling or try to impress her by embroidering on the truth (or out and out lying!) and you will be smacked down by the barb in her waspish comment. Wishing you much joy with your two Queens! That's SUCH a good description of her – and thank you, am very much looking forward to seeing her!